The number of people seeking treatment for crystal meth addictions has tripled over the past five years in Alberta, rising faster than any other substance. According to the latest numbers from Alberta Health Services, 31 per cent of people entering addictions treatment in the 2017-2018 fiscal year reported using crystal meth, up from 10 per cent in the 2012-2013 fiscal year. Addiction workers say the latest numbers, obtained by CBC News, point to the growing need to address meth addictions even as the opioid crisis garners headlines and government response. "The numbers don't surprise me one bit, not one bit," said Ethyl Fiddler, who provides outreach addiction support through Boyle Street Community Services in Edmonton. "The effects do, the effects totally do. I don't know if I had blinders on before and I didn't see the destruction it's caused but I sure see it now." The opioid crisis, Fiddler says, captures public attention because of its deadly outcome. But the health effects of crystal meth are often prolonged, each high destroying parts of the central nervous system and increasing the risk of myriad health problems. "You probably will not physically die, but your mind will be gone," she said. Fiddler says a woman from southern Alberta sent her a picture of a young woman a few months ago, asking if she'd been using the services at Boyle Street. Fiddler emailed her back, confident she had never seen the woman. Fiddler received an updated picture a few days later. It turns out she had seen the woman almost every day for weeks, she'd just become unrecognizable from the damage meth had wreaked on her body. "That's just one of them and I see that every day," she said. Fiddler says many of her clients are on a months-long wait list for a residential treatment program. An individual has to be sober for seven days to be eligible for treatment, according to Boyle Street. That often means accessing one of two detox programs in the city, which also have limited space. After a day of outreach work, Fiddler then goes home to help support her daughter, who recently relapsed on meth after 18 months of sobriety. Fiddler says her daughter, 31, was once a great student, who studied to be a plumber then switched into nursing. But since she started using again, her behaviour has become erratic, smashing the car in anger and leaving Fiddler to care for her two grandsons as she leaves the house unannounced for hours. "She just became a different person, a totally different person. It's not even her," Fiddler said. "She's not the mother she was when she wasn't using." The province recorded more than 32,000 new adult addiction services cases last year, more cases than there are people in the City of Leduc. The majority of clients reported using multiple substances. Alcohol still remains the most reported substance in new addiction cases at 82 per cent, despite dropping by five per cent since 2012-2013. Alcohol is followed by cocaine at 41 per cent and opioids at 35 per cent, which increased by four and eight per cent respectively. But at Recovery Acres in Edmonton, the most reported substance among the 54 clients is crystal meth, says executive director Jeremiah Aherne. Recovery Acres provides transitional housing and counselling services for men with a history of addiction. Aherne said. 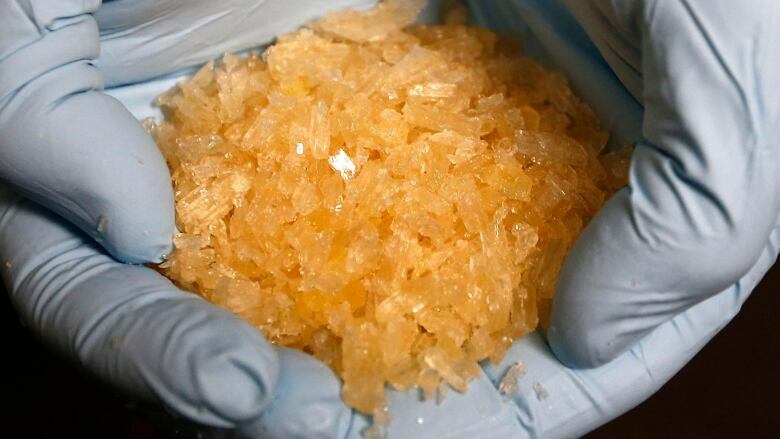 As the reported use of crystal meth goes up, the average age of the clients appears to trend down. "With alcohol, most people can waste 10 or 20 years of their life with alcohol abuse and get away with it. So, generally, you end up in treatment later. Whereas with crystal meth, you can burn your life down pretty quick and you end up in treatment in your early to mid-20s," he said. In 2016-2017, 690 Albertans under 18 said they had used the drug in the past five years, a two-fold rise when compared to 2012-2013. Aherne called rising opioid overdose deaths in the province a "public health crisis," but said the government needs to ensure other addiction services aren't being left behind. "We've got a lot of other addictions, mental health and homeless crisis going on in this province that still need attention and still need funding."